Obituary for Pamela (Chapman) Knight | Edwards Memorial Funeral Home, Inc.
Mrs. Pamela (Chapman) Knight, 84, of Milford MA, died peacefully Sunday (August 26, 2018) at her residence surrounded by her loving family. She was the beloved wife of the late Daniel P. Knight, who died in 1992. Mrs. Knight was born in Stoneham MA, the daughter of the late Gifford and the late Irene (Mooney) Chapman. She was a graduate of Everett High School and also the Newton-Wellesley Hospital School of Nursing. Mrs. Knight was a dedicated registered nurse, working at Newton-Wellesley Hospital for forty-seven years, retiring in 1999.She was a longtime member of the Massachusetts Registered Nurses Association, where she served as the local unit treasurer and as a bargaining unit member. Mrs. Knight loved to travel, was an avid reader and supporter of the Milford Town Library. She loved the beach and loved to dance, but most of all loved spending time with her grandchildren. Mrs. Knight is survived by her 6 Children: Susan L., wife of Richard Miller of Union KY; Kimberly, wife of G. Gregory Gould of Upton MA; Derek B. Knight and his wife Scarlett of Port St. Lucie FL; Jennifer Knight of Milford MA; Melissa Knight of Milford MA and Kristin P. Karlson of Franklin MA; 16 Grandchildren: Jason D. Miller, Caitlin A. Yoder, Damien T. Canali, Daniel P. Knight II, Pamela N. Knight, Ilia P. Knight, Danielle M. LeBlanc, Jonathan P. DeSantis, Joseph D. DeSantis, Michaela I. Knight, Mackenzie L. Knight, Lauren E. Karlson, Jared W. Karlson, Jake D. Karlson and Jenna N. Karlson; 7 Great Grandchildren: Ethan P. Askarpour, Hailey E. Yoder, Alexander R. Yoder, Owen D. Miller, Jamison W. Miller, Ryan T. Canali and Madison A. Lyons; 1 Sister: Bonnie Tribble of Virginia Beach VA; and several nieces & nephews. 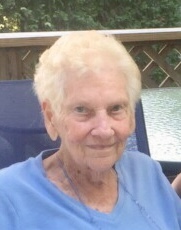 Mrs. Knight was the grandmother of the late Erica L. Miller. Funeral Services will be held Wednesday (September 5th) at 11am at the Edwards Memorial Funeral Home, 44 Congress Street, Milford MA. Burial will follow in Vernon Grove Cemetery in Milford MA. Visiting hours will be held Tuesday (September 4th) from 5pm to 8pm.